Kevin & Shahid are with you this week and they sure do have a lot to talk about. They kick things off talking about Jonathan Coachman‘s impact on the announce dynamic on Raw. How much of a departure is he from Booker T? Has Sasha Banks become Corey Graves biggest punching bag since Enzo Amore got released? Isn’t he just telling the truth about Banks though? How great was her match with Asuka on Monday Night Raw? Did she plan her poor exit from the suicide dive? Was it only second best to Johnny Gargano taking on Andrade “Cien” Almas as far as wrestling went for the Royal Rumble weekend? How good of a showing did Almas have in the Royal Rumble itself? Was the final six of Roman Reigns, Finn Balor and Shinsuke Nakamura against John Cena, Rey Mysterio and Randy Orton the best in years? Do we all forget how great Mysterio is? Were there very many surprise entrants in this years Rumble? How good did some of the former divas like Trish Stratus, Torrie Wilson and Kelly Kelly look in their return to the ring? Did some of them look rusty in the ring? 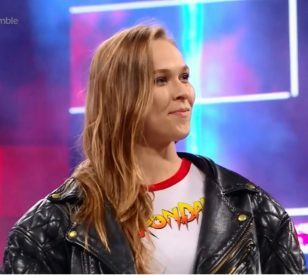 Would the Women’s Royal Rumble have gone on last without Ronda Rousey? Didn’t Asuka have the best answer to Rousey anyway by swatting away her hand? What else do the guys talk about? Find out by clicking on the link below!